I've always been a believer in simple feeding and that if you find a combination of products that work, stick to it. The feed that I give to Louie doesn't change all year round, only increase in the winter or decrease in the summer. It helps that he is a good doer, but I hold a lot of this to the balancer that he has without fail - TopSpec joint balancer. He has had it from day one, and no matter what the weather he has a cup in the morning & a cup in the evening. It has all the benefits of the comprehensive balancer being non-heating and in pellet form making it easy to add to any feed and is totally palatable. It is formulated with cereal grains and is low in both sugar and starch. As well as protein for good muscle development, it also includes hoof supplement, strong levels of anti-oxidants and carefully researched digestive aids meaning that horses can take more nutrients from forage and in the straight feeds that we give them. Add on top of all that, joint supplement. This product is designed for horses who suffer with anxiety and I started feeding it to Louie about 4-6 months after he came to me. He never overly stresses, but can sometimes find alterations to routine a struggle, and not just his own routine, but the horses around him too. Although not directly linked to that, I tested coming off this product in March 2017 & could definitely see a different in the arena and out hacking - he suddenly became VERY precious of where he out his feet. Glad to say that stopped a few weeks after re-introducing the Calmer. OK, so until May 2017, Louie was on Calm & Condition, but as he ballooned for the first time on the spring grass, I swapped it for this product and haven't looked back, even in the very cold winter we had earlier this year! It take 60 seconds to soak, and even a horse of Louie's size is only on 3/4 of a cup in each feed. In the summer, I only give him this to make his balancer and calmer less dry, and in the winter he increases to around 1.5 cups per feed, depending on his condition and the weather. 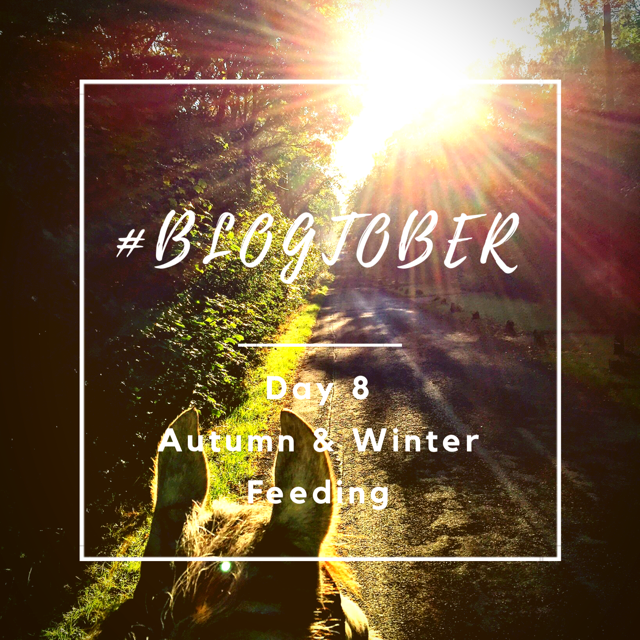 I have fed all my horses this, but as I mentioned above when Louie ballooned last May, I stopped feeding it while he was a on bit of a diet, planning to re-introduce it in the winter. However, his condition told me he didn't need it. So while it's on my list of potentials to use over winter, if Louie's body tells me he doesn't need it, I won't use it! Plenty of apples, carrots, sweets and polo mints! Whenever I bring Louie is, he has three sweets - one when I meet him, one after the gate, and one after's he crossed the road. Sometimes, he'll cheekily ask for a forth as we come across the yard, but very rarely. He also has three when going out - one when he is in the field and two for after I've taken his headcollar off. I started this as when he was young as he used to tear off almost before the headcollar was off. Now he waits for those two sweeties, and always looks VERY disappointed if I haven't got them!! He also occasionally has apples and carrots chopped into his feeds - it tends to be leftovers from home so isn't all the time. And, at our new (well, not so new now!) yard, there's 3-4 gates to do which we couldn't do when we first arrived, opting instead to get off and hop back on. Instead, I've used a couple of packets of polos to guide him around doing gates patiently, and now he can do even the trickiest ones! Great as we head into winter so I don't need to hop off and get my boots covered in mud!